San Diego, the nation's eighth-largest city, has received 626 Syrian refugees since Oct. 1, more than any other in the United States. 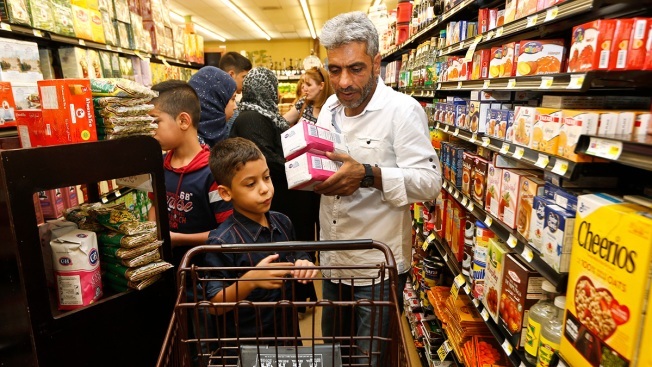 Nadim Fawzi Jouriyeh, a Syrian refugee that arrived in the United States this week with his wife and four children, puts two bags of sugaring a shopping cart with his son, Farouq Nadim Jouriyeh, while shopping Wednesday, Aug. 31, 2016, in El Cajon, Calif.
On Sunday, Nadim Fawzi Jouriyeh participated in a ceremony in Amman, Jordan, to mark the United States hitting its target of taking in 10,000 Syrian refugees in a year-old resettlement program. On Wednesday, the 47-year-old former construction worker and his family were walking grocery aisles, stocking up on roasted chicken, milk and lemons for their new home outside San Diego. It didn't take long for Jouriyeh, his 42-year-old wife and four children, ages 8 to 14, to feel welcome. "America is a beautiful country," he said through an Arabic translator at the office of the International Rescue Committee in El Cajon, a San Diego suburb that has been a magnet for Iraqis and, more recently, Syrians who are fleeing war. "The way they treat people and the people of America are very nice ... When you go down the streets, everyone smiles at you. Even if they don't know you, they just smile at you." San Diego, the nation's eighth-largest city, has received 626 Syrian refugees since Oct. 1, more than any other in the United States. Many smaller cities have accepted outsized number of Syrians, including Erie, Pennsylvania (205), Toledo, Ohio (109), and Boise, Idaho (108). California and Michigan are neck-and-neck among states for receiving the most Syrian refugees, followed by Arizona, Texas and Illinois. Cities with large numbers include Chicago (469), Glendale, Arizona (384), Troy, Michigan (325) and Dallas (293). 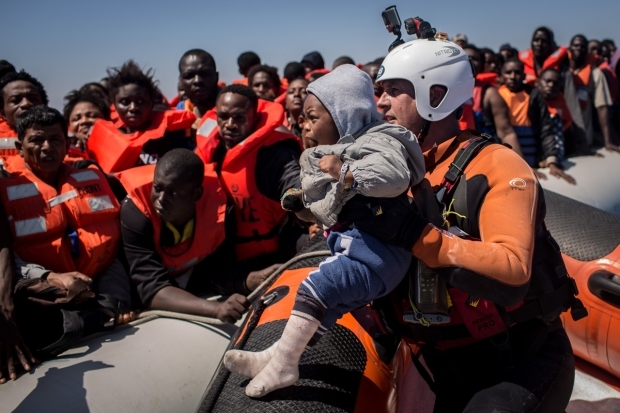 Refugees are typically assigned to cities where they have family and friends or, failing that, where there is an established community of immigrants who share their culture, said David Murphy, executive director in San Diego for the International Rescue Committee, one of nine organizations that helps refugee settle in the United States. In El Cajon, population 100,000, some store signs on Main Street are in Arabic. Merchants, bank tellers and school teachers speak the language. Three decades ago, an Iraqi Chaldean immigrant settled in El Cajon and the impact "snowballed" into a large Arabic-speaking community, Murphy said. Iraqis have been coming for years but Syrians are relatively new. "It's really kind of tough to know how they're going to do. They haven't been here long enough to start businesses or anything like that," Murphy said. Jouriyeh, who left school after ninth grade in his native Homs to work, fled his war-ravaged city for Jordan in 2014. Daily bombings frightened the children as the Syrian government retook the city. Jouriyeh had to stay indoors for three days straight because it was too dangerous to go to work. A drive to the Jordanian border that would normally take two hours required three days as the family tried to avoid roadblocks, arrest and crossfire. Jouriyeh said about 80 people were killed in his convoy. Extensive vetting by the International Organization of Migration and the U.S. State and Homeland Security departments in Jordan led him to San Diego. The U.S. said its target of resettling 10,000 Syrian refugees in the 2016 fiscal year was reached Monday, more than a month ahead of schedule and the night Jouriyeh reached San Diego. The U.S. resettlement program focuses on the most vulnerable refugees, including those who were subjected to violence or torture or are sick. Close to 5 million Syrians have fled civil war since 2011. Most struggle to survive in tough conditions in neighboring countries, including Jordan, which hosts close to 660,000 Syrian refugees. The future of the U.S.'s role may be tied to presidential politics. Republican nominee Donald Trump said Wednesday that he would suspend arrivals from Syria, portraying them as a potential security threat. Jouriyeh said his top priorities are to find a job, enroll his children in school and find permanent housing. He wouldn't say if he would ever return to Syria. "We hope our children succeed in education and be able to have a good future here," he said. Their days are filled with chores like opening a bank account and getting a phone. International Rescue Committee offers classes on English, job-hunting and citizenship. While grocery shopping on Wednesday, a Syrian vendor who came to the United States in 2010 introduced himself to Jouriyeh and asked about his journey. The strangers chatted pleasantly for a few minutes and said goodbye.